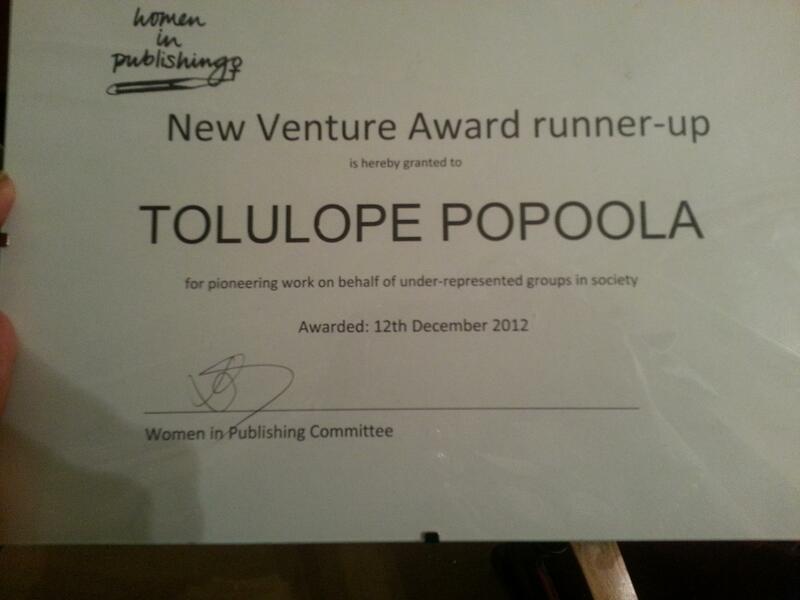 Last week, we got an email to inform us that Accomplish Press (and Tolulope Popoola) had been shortlisted for the Women in Publishing New Venture award! The awards ceremony was held on the 12th of December 2012 at the Women’s University Club in Mayfair. The announcements were made, first for the Pandora Award, which recognises a “woman who has made a significant and sustained contribution to the publishing industry” and this year the runner up was Sam Missingham, The Bookseller’s head of marketing and events and the co-founder of Futurebook. The winner was Marjorie Scardino, the CEO of Pearson, who has been in the role for fifteen years. Then it was time for the New Venture Award! This award aims to recognise “a woman who has done pioneering work on behalf of under-represented groups in society”. Claire Pimm, the co-ordinator of the event and a committee member for Women in Publishing, said they were really impressed by the quality of candidates for the award this year, so they included a “Special Recommendation” category to recognise a third woman. Tolulope Popoola is delighted to be recognised by such a great organisation of inspiring and creative women, and we’re very grateful for the honour. It’s such a lovely way to round up our first year in publishing! We look forward to even more achievements, and more exciting things to come in 2013!